Ria Loves Pawlish: Pixi February 2015 Makeup Samples Swatches and Reviews! 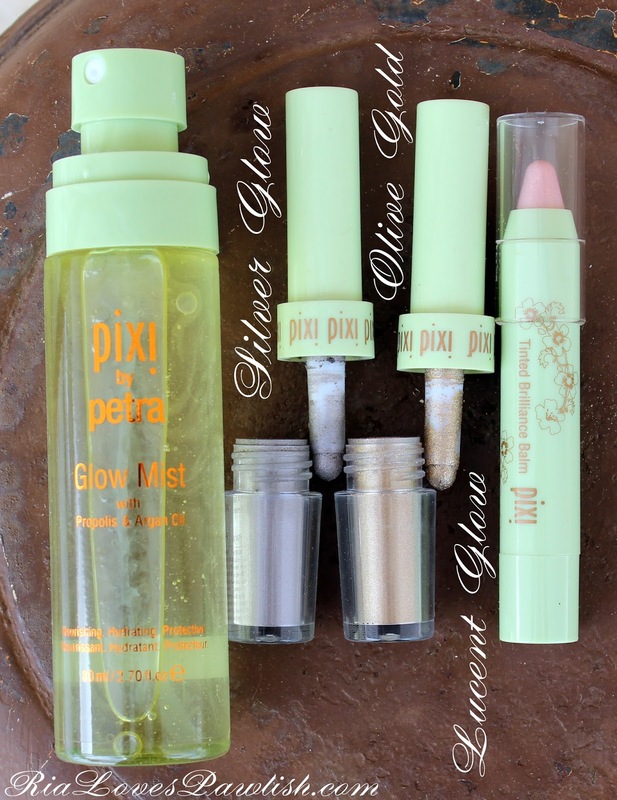 Pixi February 2015 Makeup Samples Swatches and Reviews! we got a few inches of snow here last night, which is enough to freak everyone out enough to stay off the roads... plus, it's super cold so no barn today. i'm thinking i probably won't get there all week because it's supposed to be freezing all week... with possibly more snow! miss California more and more, i tell ya! it's time for my favorite makeup sample box for bloggers from Pixi for February! (all products are samples, kindly provided to me for review). this one included a new skincare product which i love! 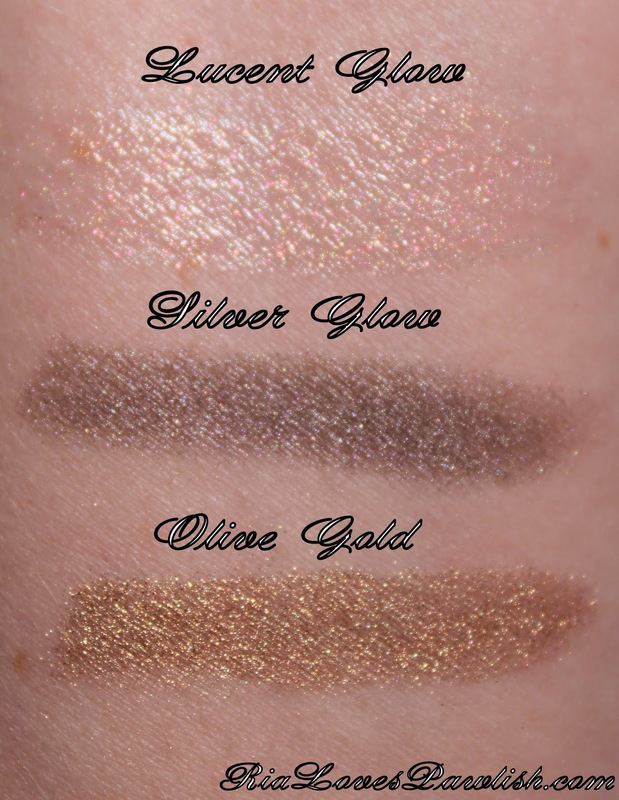 the products are... Glow Mist, Tinted Brilliance Balm in Lucent Glow, and Fairy Dusts in Olive Gold and Silver Glow. here's a look at the packaging! first up... the Glow Mist with Propolis & Argan Oil! 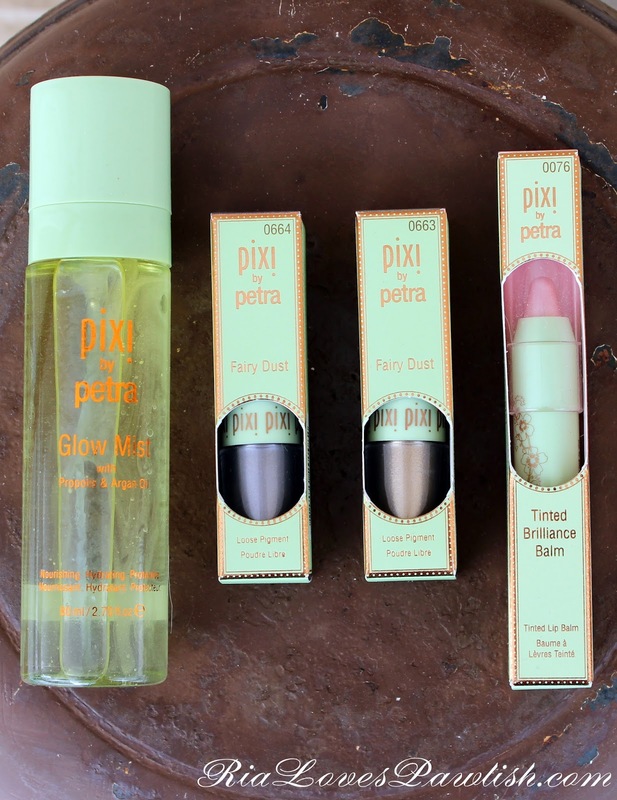 i have never tried any Pixi skincare type products, so i was delighted to receive this in my box :) i'm also a huge fan of spray products for the face and use them daily. this product separates into two liquids which need to be shaken up and mixed before use, similar to eye makeup removers that contain oil. it's chock full of different types of oils, so i'm sure that's why! Glow Mist has a light citrusy herbal smell which is quite refreshing, and absorbs quickly into my skin in these dry winter days. i have slight burning/tingling when i use it (but it doesn't last very long) because i use the strongest prescription retinoid product on the market daily, so my skin is pretty sensitive to anything with citrus. personally, that doesn't bother me as i use grapefruit products nightly (talk about BURNING) but it's something to keep in mind if you use retinoids. next we have the two Pixi Fairy Dusts. Silver Glow is a rich pewter color and Olive Gold is exactly what its name suggests... a green toned golden color! i love that Fairy Dusts pigments have an applicator... it just makes them so much more user friendly! Pixi Tinted Brilliance Balm in Lucent Glow is one i had actually purchased for myself last year, it's really pretty! it leaves lips with a nice sheen and subtle pink sparkles. it has a slight scent that really reminds me of tea... not sure what it is! here's Lucent Glow on the lips.